The Heliocentrics – the London-based collective centered around drummer Malcolm Catto, bassist Jake Ferguson and producer Mike Burnham – first performed with legendary Ethiopian Jazz composer/arranger/pianist/vibraphonist Mulatu Astatke in early 2008. 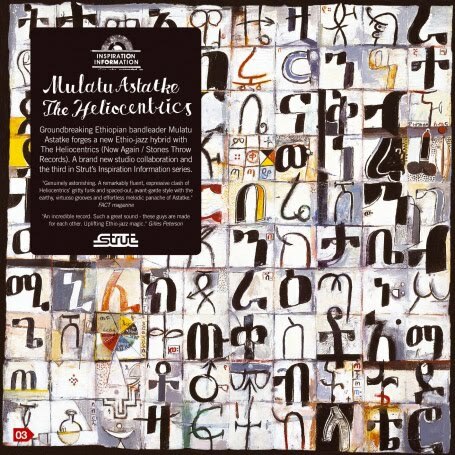 The pairing went so well – Astatke celebrated the band as the Heliocentrics performed the classic songs Astatke recorded for the Ethiopian Amha label in the late 60s and early 70s – that a collaborative recording session became a must. Thus began the landmark sessions in the Heliocentrics’ cavernous studio that resulted in Mulatu Astatke and The Heliocentrics: Inspiration Information 3. Though the ensemble run though some of Mulatu’s classic recordings, the bulk of this album is newly recorded psychedelic jazz with a funk and rock edge. Astatke’s presence clearly challenged the band to write and record an album worthy of the legend. 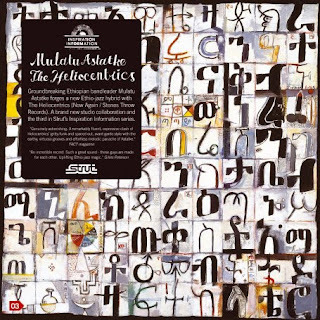 From melancholic modal musings to thunderous funk, Mulatu Astatke and The Heliocentrics: Inspiration Information 3 follows in the lines of the landmark, impossible-to-categorize albums that Astatke and the Heliocentrics have offered to the world.